We’ve all heard of the terrible two’s and all the drama of the new found independence of toddlers. But for some families the three’s can be even more challenging than the previous year. With our first daughter the age of three was a dream, but with our second we’ve discovered a new phase we’re not too pleased about, the threenager. The threenager is that age when your three year old continually acts like they are going on 13. They have attitude for miles, a stubborn streak, and want what they want…when they want. Hell hath no fury like a threenager who refuses to nap. 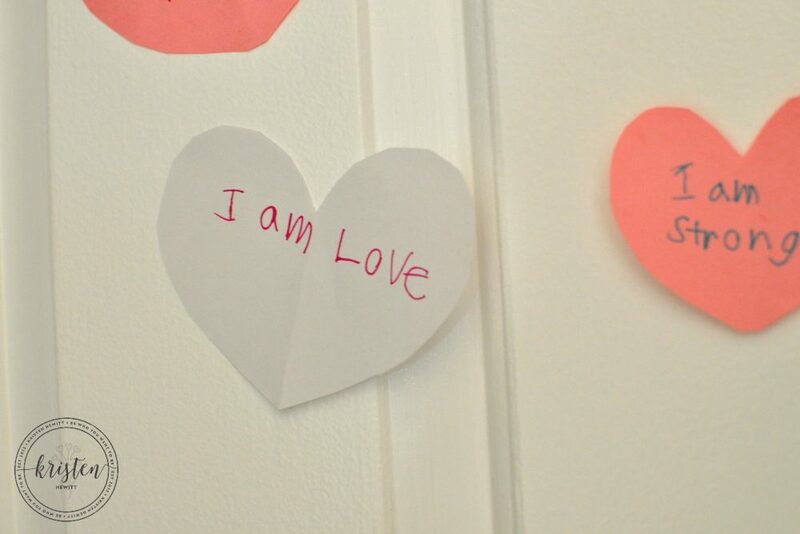 Are you living with a threenager? Here are some tell-tale signs. You live in constant fear of how to cut the shape of their sandwich or toast. Do they want triangles today, rectangles, squares? And when they do tell you, they change their mind right after you cut it. You go through three or more wardrobe changes a day. Please just pick a princess already! To nap or not to nap, that is the question. A threenager’s answer will always be emphatically “NO!” Unless of course it’s time for school, and they crawl into bed because they’re “tired”. They want three of everything because they are three. At red lights they yell…”Go…GOOO!” Threenagers do not possess patience. You realize they’ll be a great trial lawyer one day when they’ve just negotiated their way out of a timeout. 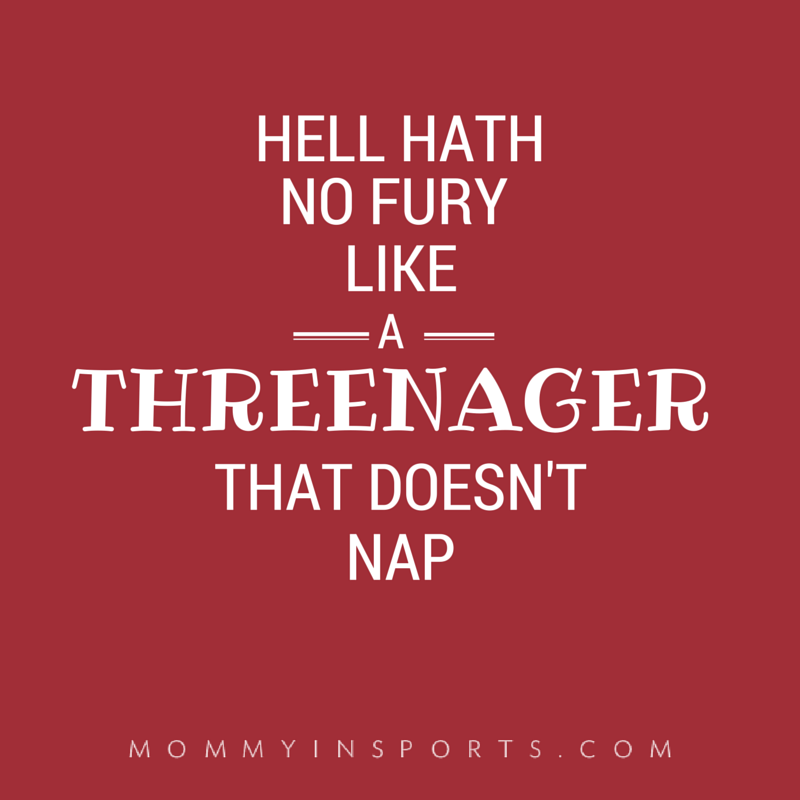 Threenagers can be tough to parent, make you weary, and zap you of all of your patience and energy. But on the flip side, this time can be so completely rewarding. As a threenager’s independence blooms so does their vocabulary, and you sometimes hear lovely things like, “You’re my best friend mommy, I love you soooo much, I want to keep you forever!” Yes a threenager may think you are their pet, but is there anything sweeter than a super tight toddler cuddle? Looking for tips to tame your threenager? 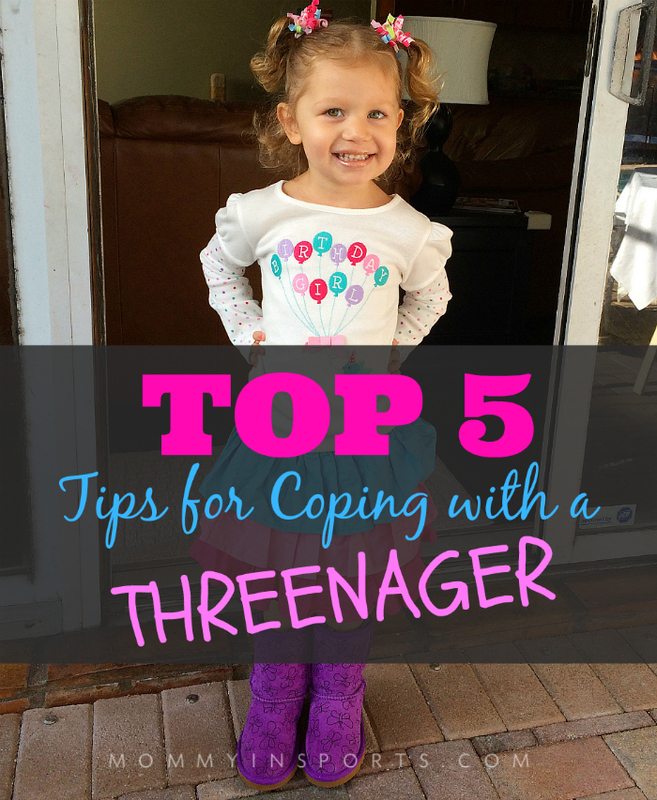 Here’s my follow up post Top 5 Tips for Coping with a Threenager! 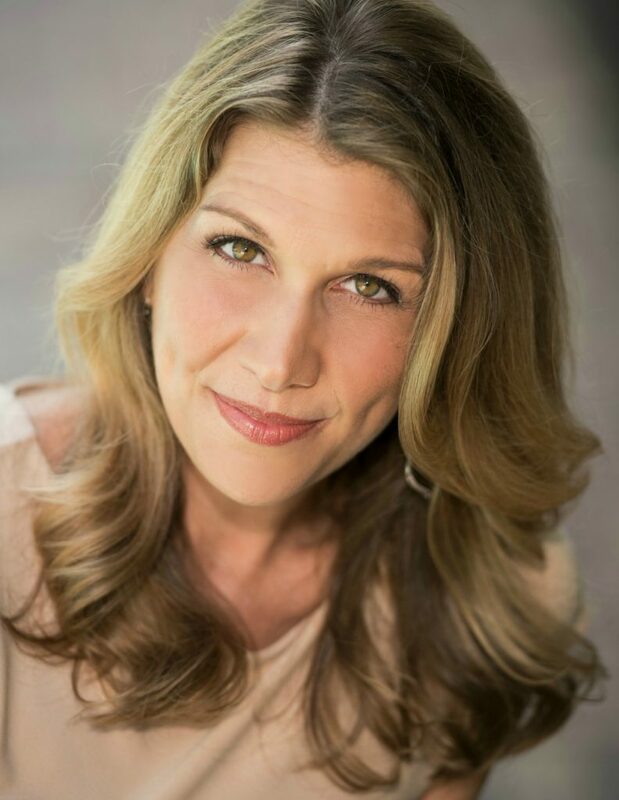 And don’t forget to follow on Facebook for more great parenting & sports stories, crafts and recipes! 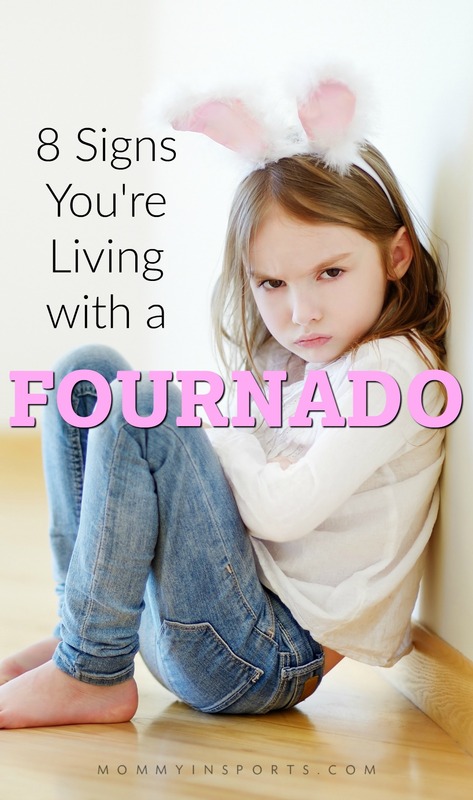 Or the 8 Signs You’re Living with a Fournado! Glad to hear we are not alone! Get ready for it…the good news though, 4 is AWESOME! Yes, yes, yes and yes again! 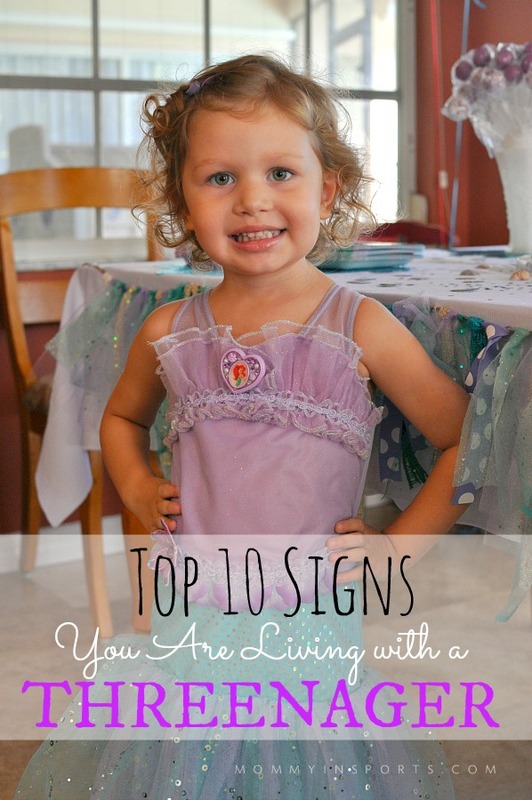 The dreaded threenager does indeed live in your house! I have one as well! OH NO! And I have two girls…. the dressing thing – JUST PUT ON YOUR CLOTHES!!!!! RIGHT?! I mean why do you insist on sundresses when it’s 60 degrees out?! Ah! Don’t scare me! Haha We are not there yet, but I’ve heard from quite a few people that 3s are worse than 2s. I’m sure it makes things easier that your daughter is impossibly cute! Sharing! lol…. mine just turned 3 and I see some of these already. Lol my daughter was a total dream child up until about 3 weeks before her 3rd birthday, which was only in November. Please tell me they get better at 4! They do get better – I found 3 1/2 with my first…but they are soooo different. I’ve learned to just lay out 4 outfits and let her choose. It may not match but oh well! Oy, it’s already starting and Annelise doesn’t turn three until May. Maybe she’ll outgrow it faster??? I can dream, right? Aw, I miss age 3. My daughter turns 13 next month. Last week, she got her braces off. This week, she got her first period. Tuesday, I took her to the inauguration of the first female governor of our state, and her biggest comment on the way home was how cute the 13 yo boy sitting three rows in front of us was. Man, childhood passes quickly! I just spit all my latte on my computer monitor… thank you! 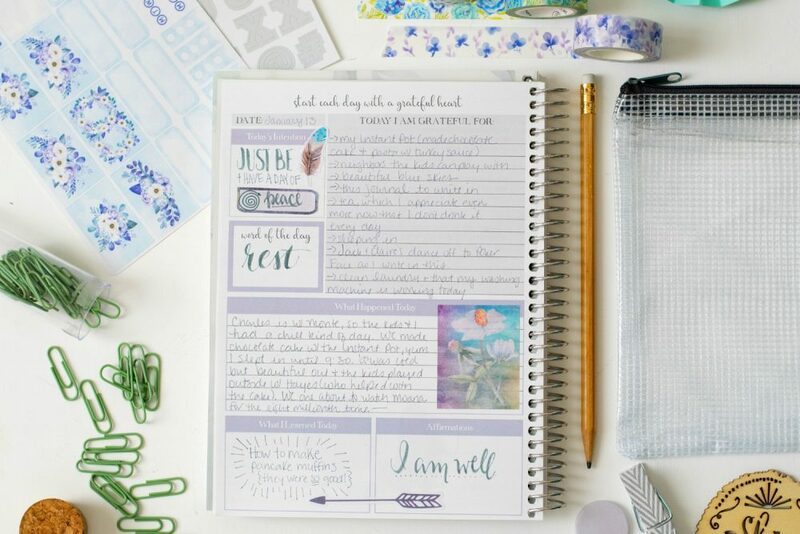 You are SO spot on – # 1, 4 and 8! 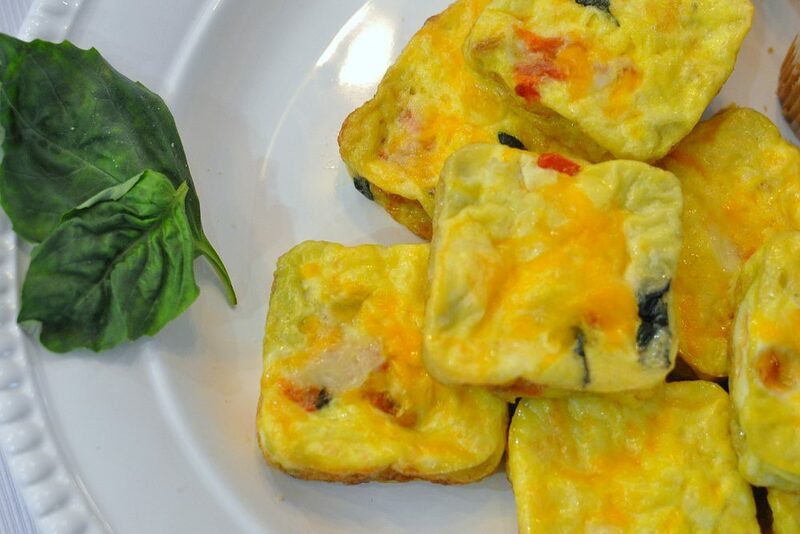 I do walk around on egg shells at meal time – it’s worse than a horror movie when you hear their scream because you gave them milk in the wrong cup! Our three year old (who refuses to potty train) walks around in a diaper all day – I gave up on getting him dressed unless HAVE to leave the house. I love you for making me feel normal! RIGHT?! What is it with the cup and plate color? IT TASTES THE SAME NO MATTER WHAT COLOR YOUR CUP IS PEOPLE!!! I thought of #11 too- when you have to ask your threenanger if you can ‘borrow’ your ipad back. SMH…You are MORE than normal…they are the cray ones! They are all so different. My oldest was so easy going then hit 13 and I swear the DEVIL showed up in my house. Now at 17, I don’t want her to go to college IN SAN FRANCISCO!!!! We live in Chicago!!!! She is funny, thoughtful, interesting, loving and so on…… Now on the other hand the 12 y/o was the most annoying threenager!!!! I am hoping for an easy going teen!! Otherwise she will be moving to San Fran with her sister!!!! 🙂 Just saying…. I would go to San Fran with her! Des isn’t there yet, but it breaks my heart to think it will happen. Scarlet was a threenager from three until now and it still comes out every now and then! Ha! We are in for it aren’t we?! Quinn is only 19 months but sheesh, these are looking like they are in my near future. Tonight she didn’t want any pajamas until it was her last set left. She was also mad that I gave her a banana broken in half. Oh and the “no bones” is an hourly occurrence here. Oh the banana! I’ll never forget at a restaurant when they sliced the banana instead of giving it to her whole. You would have thought someone shot a puppy! My first was also completely fine at 3….but my 2nd? She’s like a whole new book I don’t really want to read……….! I’m with you Jen – I’m about ready to burn all the princess dresses in protest! My daughter’s now 4 and she’s still in this stage. Or maybe it’s not a stage and her personality? I ask her to clean up toys and she either ignores me, directly says No, or complains that she never has fun! Then I mock her for her suffering. So maybe she’s just taking after me! Ooh…that is a tough age. Don’t miss those battles! OMG…I kept nodding throughout this entire post….especially the “All by myself” one. Even though my kids are older now, I remember the 3s well. 2s were a cake walk compared to the 3s, with all three of my kids! So, I’m just scrolling through my Facebook feed and see this on Huff Post Parents. I read through and laugh multiple times since my oldest just turned 4. And then what do I see but the author is someone I “know” from the blogging world. Congrats on the publication! You rock! awwww thank you! It was such a surprise that this one was such a ‘hit!’. Goes to show you never know! That IS hard. Watching my family members go through divorce, it’s extremely difficult when there’s no consistency between parents, good luck mama! The more I read about “threenagers” the more I’m convinced my son became one at 13 months old. The only difference is being able to verbalize his anger over things like the banana he wanted cut up but didn’t want cut up but did want cut up. Oh no! It IS a thing though for sure! Yes!!! Bahahhaa – all of this is SO true! I’m sorry! It DOES get easier. Then they turn four, and you’re screwed again! LOL!